As you are probably very well aware of at this stage. Men in general get a bit more cocky and sure of themselves with each passing pint. On a night out and as each pint goes down the hatch their Dutch courage and bravado gets bigger. So that’s why you should play the Arrogance Drinking Game! To begin with it’s very simple to play. Not crazy complicated rules that gets everyone confused and actually wastes precious drinking time. All you’ll need is a coin, a pint glass and everyone in the group to have a can or drink of their choice. The best man starts this stag party drinking game. He pours some of his own drink into the pint glass in the middle of the table. The player can choose how much or little he wants to put in. He then takes the coin, flips it and calls heads or tails. If he guesses incorrectly he must down what’s in the pint glass. However, should he guess correctly it moves onto the next player in the stag party group. That player must then add in something from his own drink. Flip the coin and call heads or tails. This moves around the table stopping at every member of the stag party group. If he guess right it moves on and if he’s wrong he’s downing whatever is in the pint glass. After a few rounds of correct guesses is when it starts to get interesting. Guys will start getting a little tipsy and a bit arrogant. They’ll start adding more and more into the glass. They’ll be hoping they can get away with drinking the pint. That hope won’t last as there luck will eventually run out in the arrogance drinking game. 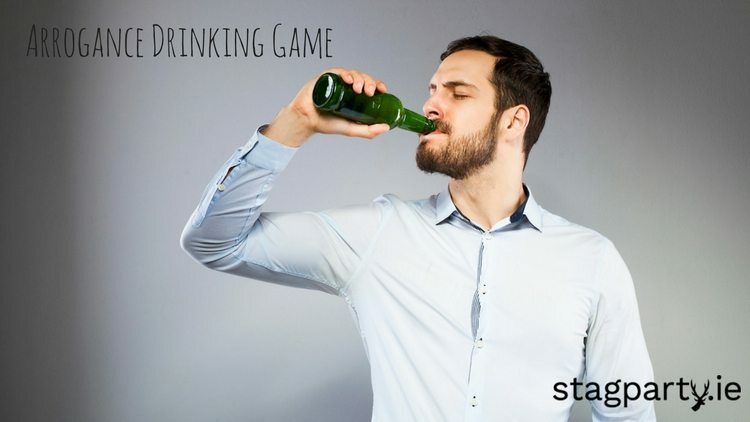 A brilliant stag party drinking game that plays on human nature, drunk guys nature and is a laugh a minute when one of the lads guesses wrong. So will you be playing the Arrogance Drinking Game on your Stag Party?